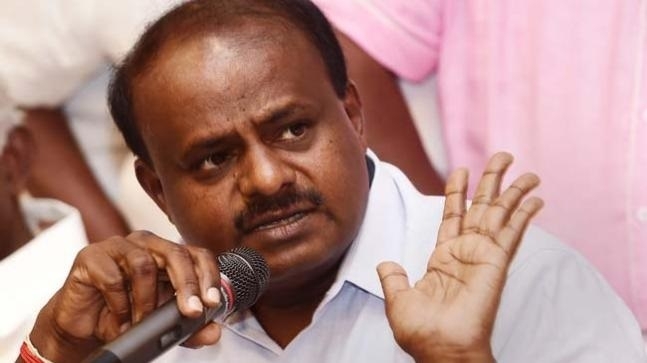 KARNATAKA Chief Minister H D Kumaraswamy said on Thursday he will not plead for support with those Congress leaders who are against his son Nikhil Kumaraswamy’s candidature as coalition candidate from Mandya in the Lok Sabha polls. Taking a dig at those opposing Nikhil, the Chief Minister said ‘those who are originally from the Congress have already extended their support and JD(S) workers are efficient to ensure his victory’. He also said his father and former Prime Minister H D Deve Gowda was yet to decide on contesting the Lok Sabha polls. “Some leaders in Mandya have gone ahead from the backdoor. It is not necessary for me to talk to them now”. “My workers are efficient, instead of trusting those backstabbing, trust those who work honestly. I’m not blaming everyone,” Kumaraswamy said in response to a question about him personally seeking support from Mandya Congress leaders. “Among the original Congress men, many of them are with us. But there are a few, I know. Situation will not come for me to go before them and plead, there is no need of it also,” he said. Kumaraswamy said even now he wanted to tell those leaders that there were no permanent enemies or friends in politics and the Congress had decided to give the seat to the JD(S) in the coalition set up. “With their own adamant behaviour, if they still want to go away with an intention to take revenge, good, they can work anywhere they want,” he added.